Even though he's not ready to settle down, Fraser MacKenzie supports his twin brother's choice to take a female sacrifice to help repopulate the clan. Yet as Fraser gets to know the lass, his dragon starts demanding something he can't have - his brother's sacrifice. Holly and Fraser fight the pull between them, but one stolen kiss will change everything. Will they risk breaking the law and betraying Fraser's twin? Or, will they find a way out of the sacrifice contract and live their own happily ever after? One of the pleasures of listening to a great story you read a couple of years earlier is to remember what you had almost forgotten. You start to remember why you loved these characters. With the author's dragons, another pleasure is listening to old friends and especially with the accents the wonderful of the superb Matthew Lloyd Davies. The dilemma was Holly coming as the first sacrifice in many years, as Fergus' sacrifice only to meet his twin, Fraser who recognized her as his true mate. They tried to ignore the pull. It just created more issues to let her meet Fergus and not make him aware of their connection. Nothing beats a mate pull. The twins close relationship is tested almost beyond repair. Holly wants Fraser but doesn't want to come between the brothers and she can't stay with her father so ill. There is plenty to keep them apart. However, dragons have strength of mind and body. Love, human and beast win out—don't they? There is plenty of action, and not just in the bedroom. Enemies of Lockguard reemerge and Holly is their target. Do not miss this in both formats. Good story line and wonderful charatures. The Dragon twins were playful and their whole dragon family were a happy family life. Listened in Audible. Worth reading. I didn't mind the story but I had a hard time with the dragon voices. It was hard for me to take the characters seriously, it just seemed a little over the top. I didn't finish this one. Could not stand male character's voice. Sounded like a winning 14 year old boy. Not how I want main male lead to sound. The Dragon’s Dilemma, what a dilemma! The dragons dilemma is very well written! This is a book you can get lost in. Holly sacrifices herself for her father who is gravely ill. Gets assigned a Dragonman. Unfortunately she falls for her assigned Dragonman’s TWIN!! You have to read this book as Holly is the first sacrifice in 15 years for Lochguard!! I was given an ARC by the author to read,beta read and review. Holly offers herself up as a sicriface in order to save her dad....but despite the how hansome her assigned Dragon man is she can't keep her eyes off of his brother. Frazer is not ready to settle yet but he supports his brother on making the sacrifice happy...still when he meets Holly his dragon and himself find it hard to keep away. Holly and Fraser fight the attraction as much as possible but for how long? Will they hurt Fraser's brother or will they find a way to be together? Jessie keeps making things better and better and now there are 2 series to love and to wait to read more and more. Fast paced with humour and sassiness the chemistry between the two was amazing!!! !The narrator really brings into life the characters and makes the book truly alive. 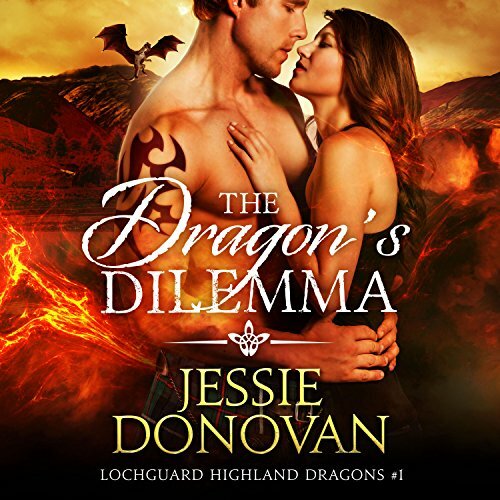 I really can't wait to read more from the Lochguard Highland Dragons Clan! Oh wow does this story hit right in the emotions. I found myself with a tear in the eye more than once. Listening to the story becomes a very emotional journey, making the difficulties Fraser and Holly go through more real somehow. The narrator does another amazing performance.